Hisako Yamasaki sensei, JNA member of the board & Honorable Executive Educator from Japan !! Buffet lunch at 4 star hotel with Hisako Yamasaki sensei is included! 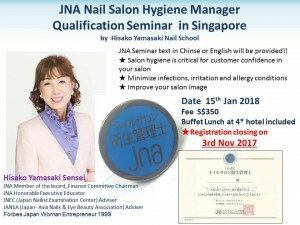 You can get JNA Nail Salon Hygiene Manager Qualification and Badge in this seminar! JNA Seminar text in Chinse or English will be provided!! Candidate list will be sent to Japan in advance so it is very important to register before closing date to avoid missing this golden opportunity!